To celebrate the band's illustrious first 10 years, in which they have enjoyed many career-defining moments and countless critical accolades, Virgin is proud to present this expanded, deluxe version of 'Moon Safari'. This strictly limited edition release is a 3-disc package wrapped up in a collector case bound book (DVD-size). Disc 1 features the seminal debut album while the 10-track second Disc includes rarities, remixes (Beck, Moog Cookbook) and key songs from radio sessions recorded during 1998 on both sides of the Atlantic. Disc 3 - a DVD - is the hour-long Mike Mills documentary 'Eating, Sleeping, Waiting and Playing' filmed in New York, London and Paris during Air's first tour. I like this album and would recommend anyone who has never heard of it to try it out. Music wasn't all that bad 10 years ago hey! Just can't find where I left the last 10 years. I wonder who'll be releasing such an album in 10 years from now? 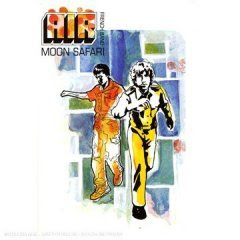 Moon Safari 20th Anniversary?! Any suggestions, please leave a comment.